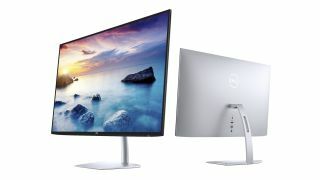 Dell has revealed a pair of new Ultrathin 24-inch and 27-inch monitors over at CES, which the company claims are the brightest ultra-slim monitors in their class (i.e. the same sized displays). The Dell 24 Ultrathin Monitor (S2419HM) is a Full HD panel, whereas the larger 27-inch model (S2719DM) has a QHD resolution, but they’re otherwise the same. So, exactly how thin are these displays? They’re only 5.5mm at their thinnest point, at the very edge – 29mm at the thickest point – and have a slim stand to go with this svelte nature, not to mention an InfinityEdge display which means the bezels are vanishingly small. The other selling point, as mentioned, is that these Ultrathin models kick out a much higher brightness level than their predecessors, at 600 nits versus 400 nits – and that extra brightness can be put to good use when displaying HDR content, which is supported by the monitors. On top of that, Dell’s CinemaColor tech gives HDR material even more pop, with deeper blacks and vibrant colors, the company promises. These are IPS panels, so viewing angles won’t be a problem, and color accuracy is impressive, with in excess of 99% sRGB color coverage, and 85%+ in terms of DCI-P3. The overall design is sleek and minimalistic, with a cable-tidy hole in the back of the stand – the latter also allows the display to be tilted forwards by 5 degrees, or backwards by 21 degrees. As is usually the case with monitors these days, Dell has incorporated flicker-free technology to go easier on the viewer’s eyes, as well as reducing blue light emissions with Dell ComfortView. The 24-inch model will retail at $300 (around £220, AU$380), with its 27-inch sibling weighing in at a more expensive $500 (around £370, AU$640). Both displays hit the shelves on January 30 in the US.